smallcases are flexible instruments that can be managed at anytime. You have the provision to buy & sell individual stocks or some shares using the Manage option. 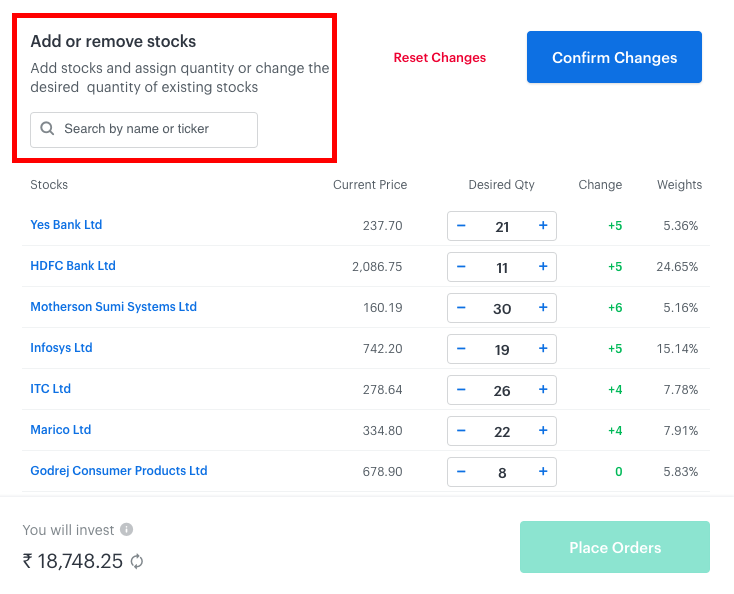 From the Investments page, navigate to the smallcase you want to add/remove stocks from and click on 'Manage' under smallcase Constituents. To buy a new stock, search for the stock in the search box and add it to your smallcase with the desired quantity. To buy additional shares of an existing stock, you can do so by clicking on the '+' in the Desired Qty column, or by entering the desired quantity in the same column. Once you are satisfied with the changes, you may 'Confirm Changes' and place orders. If not, you can Reset Changes and start over. To sell a stock, reduce the desired quantity to 0 to sell all shares of that stock.